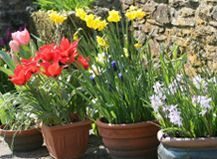 If you have never grown bulbs before or have little outside space, a planted pot or window box is an easy and rewarding project. 1/ Choose a container with good drainage. Place broken pottery or grit in the bottom and fill to about 3 inches with potting compost. 2/ Begin by placing the tulip bulbs at the bottom about 1 inch apart with the nose pointing upwards. Add another layer of compost then the miniature daffodil bulbs add a third layer of grouped iris and crocus. You can pack the bulbs fairly densely in a container but make sure they are not touching one another or the sides. 3/ Keep at least 1 inch free around the top for ease of watering. Protect from frost by placing in a garage or shed during cold weather. 4/Once flowering has finished allow the leaves to die back naturally and feed with a bulb fertiliser. The daffodil and crocus bulbs should continue to flower for several years.